ABOUTMIDLAND: Hailing from Dripping Springs, TX lead vocalist Mark Wystrach fronts Midland’s rich sound that is rounded out with lead guitarist Jess Carson and bass player Cameron Duddy. Rooted in tradition in both sound and style, the trio initially garnered attention playing clubs in the region. Their critically-acclaimed freshman album,ON THE ROCKS(Big Machine Records), features 13 tracks with songwriting credits from each member alongside hitmakers Shane McAnally and Josh Osborne. Launching to rave reviews from notable outlets such as the Los Angeles Times and Rolling Stone Country, ON THE ROCKS was declared “the year’s best Country album” by Washington Post. The Dann-Huff produced album earned the No. 1 position on Billboard’s Top Country Album Sales chart upon release. Their debut No. 1 single “Drinkin’ Problem,” which offers an intentional nod to Country music reminiscent of the 1970s and 80s, earned the band their first GRAMMY® Awards nominations forBest Country SongandBest Country Duo/Group Performance. Midland was also named New Vocal Group of the Yearat the 2018 ACM Awards and are nominated for three CMA Awards including Vocal Group of the Year, Single of the Year for “Drinkin’ Problem” and New Artist of the Year.Their current single “Burn Out” is Top 20 at Country Radio and the band released a video for the song which was inspired by the vintage style of Urban Cowboy and filmed at the legendary Billy Bob’s Honky Tonk in Fort Worth, TX.This year Country Radio Broadcasters voted the trio as one of the esteemed 2018 CRS New Faces. 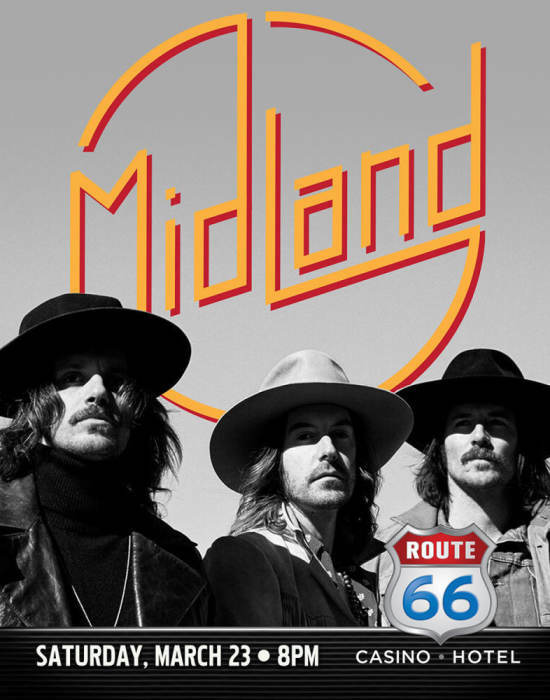 Midland is currently on the road headlining dates for their ELECTRIC RODEO TOUR. For a full list of tour dates and more, visitMidlandOfficial.com.